Journalism.co.uk is attending JEEcamp today – an ‘unconference’ (e.g. any attendees can suggest the topics for discussion) about future models for journalism, focusing on enterprise and experimentation. Organsied by Birmingham City University lecturer and Online Journalism Blog blogger Paul Bradshaw, the event is a sell out – but there are plenty of ways to follow what’s going on. There’s a liveblog of the event here. There will be lots of twittering (see the attendees list for a rough guide of who to follow and @journalism_live) under the #jeecamp hashtag. If you tag your tweets in this way they’ll be fed through to the CoverItLive bloggers too. This entry was posted in Events, Online Journalism and tagged City University, CoveritLive, jeecamp, Journalism.co.uk, lecturer, Paul Bradshaw, US Federal Reserve on May 8, 2009 by Laura Oliver. Nieman Journalism Lab reports on NPR’s ‘backstory’ project – a Twitter account, automatically fed, that updates with relevant archive content around current trends. The code that powers it detects if lots of people suddenly start searching for a certain term and searches NPR’s archives for related stories, before posting a link to Twitter. This entry was posted in Editors' pick, Online Journalism and tagged archives, Archiving, nieman journalism lab, NPR, NPRbackstory, Twitter, US Federal Reserve on May 5, 2009 by Laura Oliver. The Telegraph’s Kate Day asks whether Twitter and blogging lead to a different kind of ‘lazy’ journalism, or a different kind of ‘more open media’. “I was struck by the subdued atmosphere amongst the experts and financial journalists in the room. There was a lot of shaking of heads and very few leapt to their feet when the floor was opened up for questions. This entry was posted in Citizen journalism, Editors' pick, Online Journalism, Social media and blogging and tagged blogging, Financial Services Authority, fsa, grip traditional media organisations, journalist, kate day, Mark Jones, open media, reuters, telegraph, Telegraph.co.uk, the Telegraph, Twitter, US Federal Reserve on March 13, 2009 by Judith Townend. Thomson Reuters went all out this morning in its coverage of Prime Minister Gordon Brown’s speech at the company’s London office. 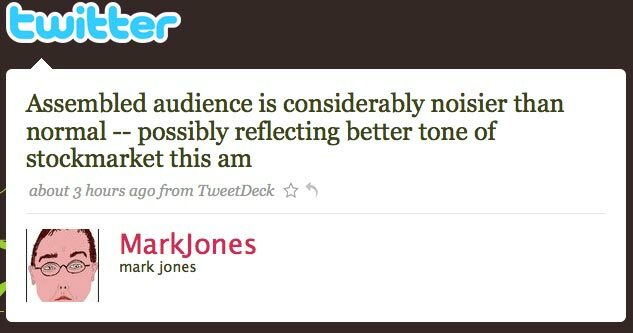 First off the organisation’s own coverage: the Newsmaker event was twittered by Reuters journalist Mark Jones, whose updates were fed into a special microsite. There was also video of the PM’s announcement originally livestreamed on Reuters’ website – including a handy dropdown menu that lets you skip through the clip to different key moments. A full transcript and text article of the speech have also been published on the site. But in addition to Reuters’ own reporting on the event was live footage streamed using mobile phones and hosting service Qik by social media bloggers Documentally and Sizemore. “With Gordon Brown due to start talking on the present economic crisis what can two beardy blokes with a few laptops and small cameras possible hope to add? “Well nothing directly on what is about to be said. I have as much interest in current politics as I did in marketing movies. I’m here with Christian [Documentally] to start conversations around the NewsMaker event that are currently not part of Reuter’s remit,” wrote Mike Atherton aka Sizemore in a blog post. The pair also used social media tools such as online site Phreadz, which builds multimedia forums around content submitted by users, to generate discussion around Brown’s speech. “I sincerely hope that following today the idea of getting these events discussed on social media platforms such as Twitter, Seesmic and Phreadz becomes a natural part of the news media’s roadmap,” added Atherton. This entry was posted in Multimedia and tagged Documentally, Gordon Brown, journalist, Mark Jones, Mike Atherton (Sizemore), mobile phones, news media, online site, Politics, Prime Minister, reuters, Reuters.co.uk, social media, social media platforms, social media tools, thomson reuters, Twitter, US Federal Reserve on October 13, 2008 by Laura Oliver.